Can Septic Tanks Be Pumped In The Winter? Winter weather varies greatly in Georgia. The southern part of the state rarely sees winter temperatures below 40 degrees Fahrenheit whereas northern Georgia regularly sees temperatures in the low 20's during the winter. Here, in the Atlanta area where we provide plumbing services to our customers, the winters can be very mild with only the occasional severe weather occurrence. If you have a septic tank on your property you may be wondering if septic tanks can be pumped in the winter? Yes, they can but it's much more difficult and expensive. Factors to look at are the type of ground the tank is in, the level of difficulty to get through any snow and/or ice and if the tank and/or water lines have frozen. Snow - you might think that if there's snow on the ground the chances of your tank freezing are greater but that's not true. Snow actually acts as an insulator so, the more snow the better - especially if it's not compacted. Ground cover - if your tank is buried under a good amount of plant cover that also helps to prevent freezing. Usage - a septic tank will be more likely to freeze if it's used rarely. This can happen often with snowbirds who spend their winters in a warmer climate. Leaks - if there is a leak in your septic system, that leak could easily freeze and cause havoc with your water pipes and septic tank. If you suspect that any of these situations have occurred - please call us at Atlantis Plumbing 770-505-8570. 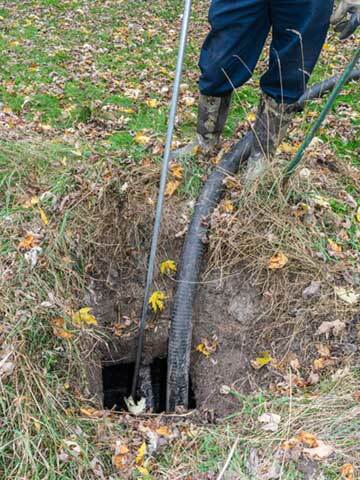 It's important to have professionals assess the septic system and make the necessary fixes. Many homeowners will try to fix the problem themselves and more often than not, more problems are created which end up in a much more expensive solution. So, here's a list of what NOT to do if you suspect that your septic tank has frozen. Do NOT attempt to warm your frozen pipes with an open flame. Do NOT add salt or antifreeze to your septic system. Do NOT run water to try to "unfreeze" everything. Don't EVER start a fire over the septic tank - it won't thaw it out! So, what would be the best time of year to get your tank pumped? Generally, springtime is when the underground water table will be at it's highest (spring showers of course!). This makes it the BEST time of year to get your septic tank pumped. The standard recommendation is to get your tank pumped every 3 years. If you follow that rule - you should be able to extend the life of your tank to it's fullest and experience no major problems. How to tell if a septic tank is full? The signs to look for are odor coming from your drains and toilets, very lush grass over your tank, standing water over or near your tank, sewage backup and sluggish draining in your sinks and toilets. Will septic tanks work without power? Septic tanks require power so if there is a power failure, the tank will hold the collected water until the power comes back on. According to www.dph.georgia.gov - "An audible high water alarm is required in the dosing tank to notify the homeowner in the event of a pump failure." If you have any questions about your septic tank system, call the Atlanta plumbers - Atlantis Plumbing today at 770-505-8570. We are available 24 hours a day, 7 days a week.